Dr Sameer Mehrotra is a Consultant Cardiologist in North West Delhi and has 14 years of experience in this field. Dr Sameer Mehrotra practices at Max Hospital in Shalimar Bagh, Delhi. 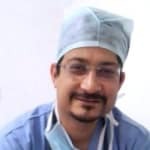 Dr Sameer Mehrotra has completed his MBBS in 1998 and MD (Internal Medicine) in 2002 from Institute of Medical Sciences, Banaras Hindu University, Varanasi. Also, he has done DM (Cardiology) from All India Institute of Medical Science, New Delhi in 2009. Prior to joining Jaypee Hospital, he was at Medanta Hospital, Gurgaon. Dr Mehrotra is proficient in interventional cardiology, electrophysiology, pacemaker and device implantation. He has performed more than 5000 simple and complex angioplasties and has wide experience in handling simple and complex arrhythmias, pacemaker and devices implantation(more than 200) and follow up. His area of interest includes complex angioplasties, left main disease and CTO?s. Dr Mehrotra has five research papers published in national and international journals to his credit. He has been a faculty at various conferences and is a member of Cardiological Society of India and Indian Heart Rhythm Society. Dr Sameer practices at Max Hospital, Shalimar Bagh, North West Delhi and charges Rs800 as the consultation fees so, when you are dealing with a complex health condition like heart disease you can book an online appointment with him. According to the reviews of the patients, Dr. Sameer is a very efficient doctor. We highly recommend him because of his competence and patient friendly nature. Unlike other doctors, Dr Sameer gets the tests done only if absolutely necessary and is capable of handling all cardiac emergencies. Akhil Mehrotra in the last week Dr. Sameer being an expert Cardiac consultant has a very down to earth personality and very systemically explains and take care of patients. My mother is under his care and she has a healthy life after operation. I highly recommend Heart and Rhythm Care Clinic. I found the answers provided by the Dr. Sameer Mehrotra to be helped me improve my health and knowledgeable. Thanks a lot sir. I for sure will abide by what you say. I know am doing it wrong but will try to get it in track ASAP. Thanks a ton for your time. I found the answers provided by the Dr. Sameer Mehrotra to be very helpful, thorough, caring, sensible and professional. Advise of the doctor is very helpful. Thank you Sir. Best doctor I have ever seen and met with,very friendly nature, patient friendly , knowledgeable, detected and treated my problem in a wonderful way . Thanks to Dr Sameer ! I found the answers provided by the Dr. Sameer Mehrotra to be very helpful. Thankyou very much. I wish you would add how much risk is my present condition to my heart. I found the answers provided by the Dr. Sameer Mehrotra to be very helpful. Thankyou very much sir..I was more concern of dependency of medecine..
Dr. Sameer Mehrotra provides answers that are very helpful and knowledgeable. Thanks sir for your suggestion this will definately help me. Dr. Sameer Mehrotra provides answers that are knowledgeable, very helpful, well-reasoned, practical and professional. Thanks a bunch!!! I found the answers provided by the Dr. Sameer Mehrotra to be very helpful. Thank you so much for your valuable guidence.